Every good Home Ec teacher knows how to iron a long sleeved, collared shirt and indeed I do. In fact, the idea for this tutorial has been swimming around in my think tank for the past couple of weeks, then I saw it right there on ApartmentTherapy this evening. Why re-invent that tutorial wheel? Instead, check out Chez Larrson to see a clear and concise how-to of this dying skill. How to Recover an Ironing Board. 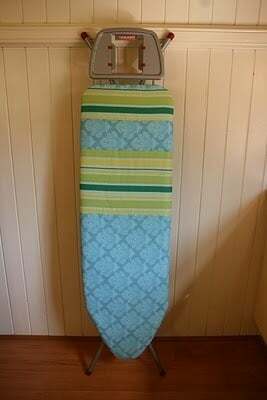 If you spend lots of time sewing, or have a bizarre penchant for super crisp creases, you're ironing board sees alot of wear. Instead of replacing it once or twice a year, give it some new life with a fresh cover.